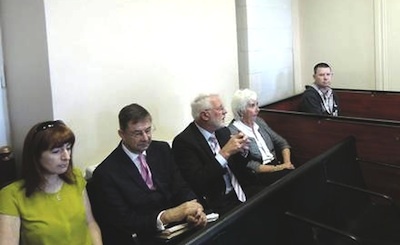 Four Irish TDs - Clare Daly, Eamon O Cuiv, Martin Ferris and Maureen O'Sullivan - recently visited the prison in which MI5 sting victim Michael Campbell is being held in Lithuania, and were horrified by the conditions he endures. A campaign is underway to apply pressure on the 26 County Department of Justice Alan Shatter and the Dept of Foreign Affairs, as well as the Lithuanian authorities, for some resolution to this horror. Campaigners for Michael have urged concerned people to sign a petition on his behalf at https://chn.ge/VscyyT and tyo write letters on his behalf. Michael Campbell has been held captive in the Lithuania prisons since January 2008. As such he is the only Irish Republican Political Prisoner being held in a foreign prison. Despite being convicted and sentenced to 12 years imprisonment in October 2011, Michael continues to be held in the most horrific conditions imaginable, thousands of miles from his home, wife and his family. Michael is not deemed eligible for repatriation to Ireland until all legal affairs in Lithuania have been concluded. Each day that passes, Michael’s human rights are violated as he is subjected to severely overcrowded and unsanitary conditions. These are the same conditions Mr. Justice Burgess highlighted in his decision to block the extradition of Michael’s brother, Liam Campbell. Justice Burgess communicated that the jail conditions in Lithuania presented a risk of inhuman and degrading treatment. His decision was based on a published report by Professor Rod Morgan, an independent expert in criminal justice and the former head of Britain’s Youth Justice Board. Professor Morgan’s report noted conditions in the Lithuanian prison to be ‘totally unacceptable’, including cells in a poor state of repair and filthy, little or no access to natural light, inadequate artificial lighting, lack of ventilation, unhygienic toilets, inadequate drinking water provision and absence of outdoor exercise facilities. If the extradition of one Political Prisoner to Lithuania was blocked due to the fact that such action would breach his right to freedom from torture, inhuman and degrading treatment or punishment under European law, how is it then legally or morally acceptable for Michael to continue to be imprisoned there? The conditions of the jail in Lithuania are in violation of the human rights standards and sanitation regulations due to overcrowding. The conditions are in direct contravention of prisoners’ human rights. In Article 5 of the Universal Declaration of Human Rights, it clearly states, “No one shall be subjected to torture or to cruel, inhuman or degrading treatment or punishment”. These are basic rights all human are entitled to. Michael’s rights are not being recognized or upheld. International human rights law lays down obligations which are bound to respect. There are obligations and duties under international law to respect, to protect and to fulfill human rights. The obligation to protect requires the protection of individuals and groups against human rights abuses. The obligation to respect means refraining from interfering with or curtailing the enjoyment of human rights. The obligation to protect requires the protection of individuals and groups against human rights abuses. The obligation to fulfill the duties under the law includes positive action to facilitate the enjoyment of basic human rights. On 05 Dec 2011 the EU Prisoner Transfer Agreement was entered into force to govern the transfer of prisoners between member states of the European Union to ensure foreign national prisoners serve their sentences in their own country. Why then has Michael not been returned to his own country? Given Michael has no voice of his own, it is on HIS behalf we, the undersigned, beseech you to act without delay to uphold his human and legal rights and petition to have him extradited to Ireland to serve out his sentence.